Choose from five layouts at our recently renovated community, The Parker @ Seventh. Which one suits your needs? Our studio, one, and two bedroom floor plans range from 395 to 824 square feet and are bright, airy, and comfortable. Even our more compact layouts are designed to maximize space. With clean lines and efficiency in mind, our homes are designed to give you all you need to enjoy the bustling location in downtown Des Moines. With sweeping city views and easy access to the best that Des Moines has to offer, you’ll love life in the heart of it all at The Parker @ Seventh. 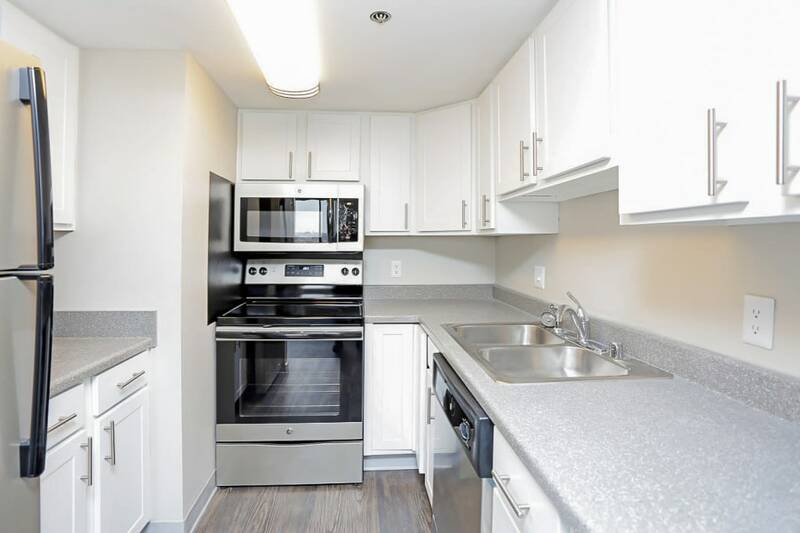 Whether you are a budding chef or a connoisseur of takeout, the bright kitchens in our studio, one, and two bedroom apartment homes are set up to maximize cupboard and counter space. If you aren’t already an expert cook, perhaps this space will inspire you to test your skills in the kitchen. Elsewhere in your The Parker @ Seventh home, you’ll appreciate the convenience of common area laundry, and flourishes like plush carpeting and wood-style flooring. Browse our Floor Plans page to find your favorite layout, and then contact our friendly management team to schedule your tour of The Parker @ Seventh.